Three years ago, I began to live my life as a patient rights advocate. I painted a visualization of my husband Fred’s medical record as he lay in hospice. 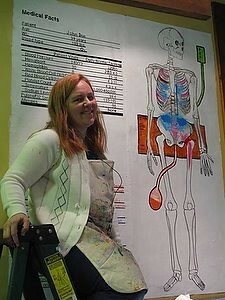 It was called the Medical Facts Mural. 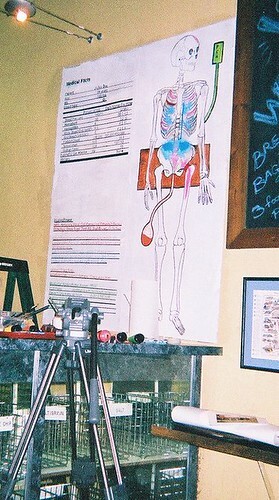 The painting consists of an anatomy drawing of Fred’s physical status combined with data from his medical record. It is painted on the wall of a deli and thousands of people have seen it in this span of years. 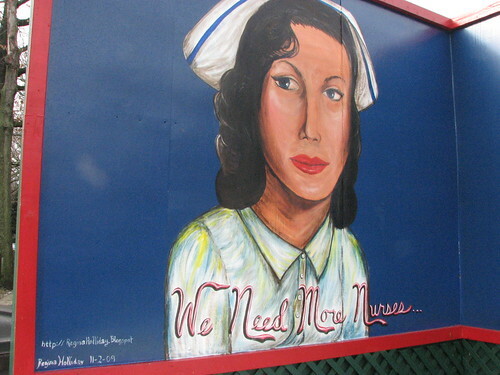 Just paint upon wall, every day it advocates for patients. Three years ago, I wrote through tears after the burial of my husband. I wrote about him and all the patients like him. I said simply, "I didn’t ask for this cup; I will drink from it, though. I will let the anguish of us all pour through me. I will be his voice. I will be your voice. We are all patients in the end. We should have the right to be treated with dignity and respect... I will stand up. I will not be silent. I will not give up the fight." These words still define my mission three years later. I have never given up. In the years hence, I have traveled throughout the country representing the patient voice within HIT (Health Information Technology). I speak about it, paint about it and write about it. Every post I have ever written still testifies for patients throughout this great nation. I have never removed a post. Sadly, this is not the case for all patient advocates. Some advocates who work for organizations have not been able to testify as freely. Some have been told not to speak, some have been told not to tweet and some have been told to remove posts that represent the outrage that patients express when they have been denied access to their data. My heart breaks for advocates like these, who in order to retain employment must bow their heads and shut their mouths within the halls of medicine. These advocates are torn between telling the truth and protecting the reputation of their organization. When you listen for their voice, it is silent. When you search for their blog post, you will see error 404: Page not found. Recently there was an announcement for an opportunity for an advocate to assume an unpaid position as a patient or consumer representative in HIT policy discussions. GOVERNMENT ACCOUNTABILITY OFFICE (GAO) has a Health Information Technology Policy Committee Vacancy. ACTION: Notice on letters of nomination to fill vacancy. I am asking all those who read this blog to nominate me for this position. I exist within this space as a database of stories. I tell the story of my husband and my sons. I speak from my patient center and with the additional resource of the hundreds of stories that populate The Walking Gallery of Healthcare. I represent no view other than the patient view itself, as told through story and data combined. As we create a new model of payment within medicine based on outcomes rather than fee for service, story as perceived by patients will have a vital role in quality measurement. Total Performance Score within Value Based Purchasing utilizes an alignment of both Clinical Process Domain and Patient Experience Domain. Patient Experience Domain is the narrative of an episode of care from the patient view. Health Information Technology provides an opportunity to create a “book” of care authored by many. The patient view must be represented as we design this new model of participatory care. I am not a non-profit nor do I represent a foundation. I am just a regular person, and like many patients in this nation do not have a degree, let alone a terminal one. I lived most of my life uninsured and lived in poverty and know well the strain of these conditions as we talk about health policy. I represent those who have no voice at this great table. Those who meet here will transform the patient’s experience for generations to come. My primary income is as a speaker and I speak for the living and the dead. I am paid enough in this role to support two children and myself in a modest life. I founded an advocacy movement called the Walking Gallery. There is no fee to join and all the members walk around the world sharing their patient stories. In the past, patient advocates were chosen from large advocacy organizations who provided a spokesperson that represented hundreds of members. In a new world filled with the tools of social media we can create similar structures without the need for a formal organization. I collaborate with a loose confederation of individuals from all levels of society working toward the common cause of truly patient, and family, centered care. Please write a letter of nomination for me before May 25th. I will promise you I will always speak from a patient view within the HIT policy discussions. I will stand up. I will not be silent. I will not give up the fight. GAO: 441 G Street NW., Washington, DC 20548. Since posting this a few people have requested letter examples. Here are a few within blog posts. Keith Boone "Who Should Represent Patients?" Andy Oram "Health Information Technology: Putting the patient back into healthcare"
Ted Eytan's "Taking Care of Business at #HealthFoo , Nomination Letter, Regina Holliday, HealthIT policy committee"
Here is a copy of the letter I just sent on your behalf. Good luck! I would like to nominate Regina Holliday for the position of Patient Advocate. For the past three years her voice, writing, and art has spoken for all of us who were unable to be speak for ourselves. She has traveled tirelessly to be present for those of us who were unable to cross the distances on our own behalf. She has painted our wants and needs when we could not find the words to express them for ourselves. Through her writing she has reached more people than any of us truly know, keeping us updated on every conference and presentation she has attended on our behalf. And she has asked nothing in return. I am fully confident that she would continue the selfless work she has already began on behalf of all Patients, were she to be awarded the position. Many of us have already entrusted her with our collective voices to speak loudly and freely on the behalf of both ourselves and our families and would be assured our best interests were at the forefront of her work were she to continue it on your committee! Here's a copy of mine nomination. I would like to nominate Regina Holliday to fill the vacancy in the GAO Health Information Technology Policy Committee as a Patient/Consumer Advocate. If the goal of this role is to have someone brave enough to speak up above the noise so the voice of the patient can be heard, then Regina Holliday is the perfect choice. Regina's experience as a patient and the wife of a patient whose care experience resonates deeply within the souls of all those who have heard it, ensures she will always speak from the heart of the patient. Since her husbands death three years ago, Regina has traveled the country speaking, writing, and painting the voice of the patient. She is a self appointed advocate who believes to her core that it is her duty to never let the voice of the patient be silenced. After her husbands death, Regina wrote the following "I didn’t ask for this cup; I will drink from it, though. I will let the anguish of us all pour through me. I will be his voice. I will be your voice. We are all patients in the end. We should have the right to be treated with dignity and respect... I will stand up. I will not be silent. I will not give up the fight." I know with every ounce of my being that if Regina Holliday was in this role, the voice of every patient... YOUR voice, MY voice, voice of those we love, and the voice of those who have no one else to speak up for them will always be represented and heard. Yeah - This is exciting to see more and more of my advocacy friends step up to the plate to do the policy work in health IT that up until now only a very few advocates have been willing to do. At times before you and Dave came along I thought I might be the only one for a while. It can be both exciting and over-whelming to keep up with both the technology and the policy issues while at the same time doing patient centered advocacy and spending the time on boards, committee and sub-committees doing the work required to develop solutions that actually benefit people/patients and our community. This is a no brainer - supporting you all the way Regina. If you want an easy way to do this, just click on the link at the bottom of this post. Supporting you all the way, Reggie. As Andre said, it's a no-brained. You are a powerful, tireless voice. Your voice has resonated throughout healthcare and HealthIT, Inspiring us all to speak up, to Share our stories and walk with you. To not be silenced. There's is not a better person for this position! Good Luck!